Fact: I am generally not a very sentimental person. Fact: The only things that I would not throw away when purging my bedroom before the big move a year ago were my t-shirts. Drawers and boxes of t-shirts…. I did pare the collection down some. I don’t want to get rid of my t-shirts because they are from important things, they are from trips and teams. They’ve had countless high quality days lived in them. Inside jokes formed, adventures had, trails blazed, Gospel preached, tears cried, sweat poured, games won, games lost, blood shed, food cooked and eaten, pictures taken, and sweet dreams come true. I can’t throw that away. Each one of those shirts are woven into the fabric of my memories, they make up that patchwork quilt of experiences that make me who I am. Since I refused to get rid of them, but never wear them all (can’t wear some of them anymore anyway) I had to figure out a solution for having 2 drawers of unused t-shirts. I decided to make a t-shirt quilt. It seemed perfects all my memories pieced together into a colorful, warm scrapbook. It’s visible and it’s usable. Perfect! It was quite a time-consuming process, and making the layout was rather tedious. I did a lot of research (on pinterest of course) and compared several examples of quilts. The problem I had was that I have so many varying sizes to the shirts that I was using which excluded most of the blocked, symmetrical patterns. So I went with a collage style approach. Normally, when it comes to crafts I take the Captain Kirk approach and leap without looking. But for this project I had to channel my inner Spock. To make sure that this quilt turns out right I had to employ the use of logic and strategy. I had to make my game plan. Step 1: Measure all the dimensions of all the graphics that I wanted to include (including at least an inch buffer for seam allowances and some margin space. I used some of Will’s engineering paper to draw out each block. 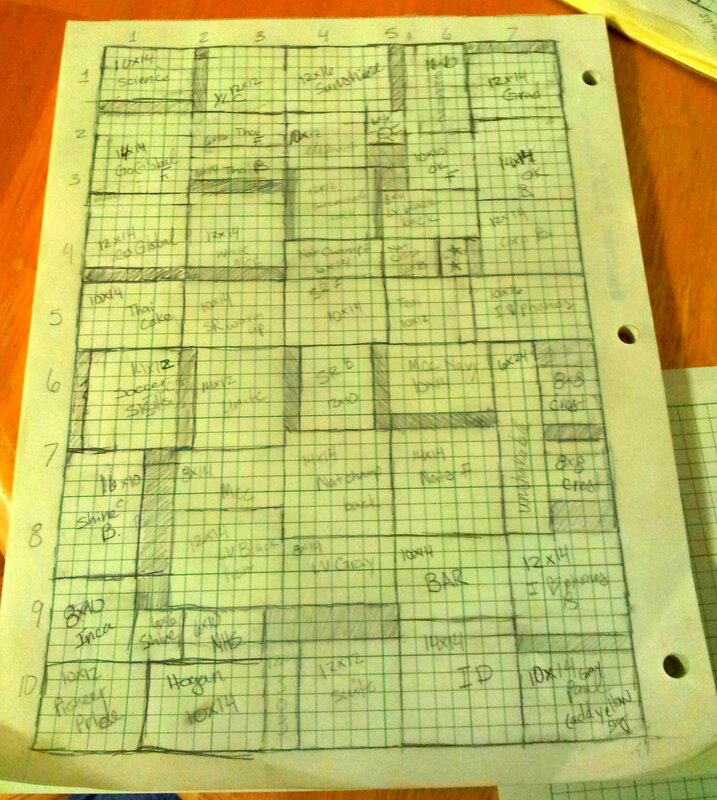 I am a very visual person, and the grid lines on the paper gave me the ability to draw out the quilt pieces to scale. Step 2: Using those dimensions, put together a puzzle. There are some places in there that will need to be filled in by other material to make everything fit. I also did this on this on the engineers’ paper. At first each square equalled two inches. this paper isn’t a layout, just a visualization of all the measurements. Step 3: Since I am not as smart or mathematically talented as Spock, I double and triple checked all the measurements and the layout that I had made. After I had checked and rechecked I taped four pieces of the engineering paper together and made a giant master layout in which each square was one inch. Here is the small scale original layout that I made. 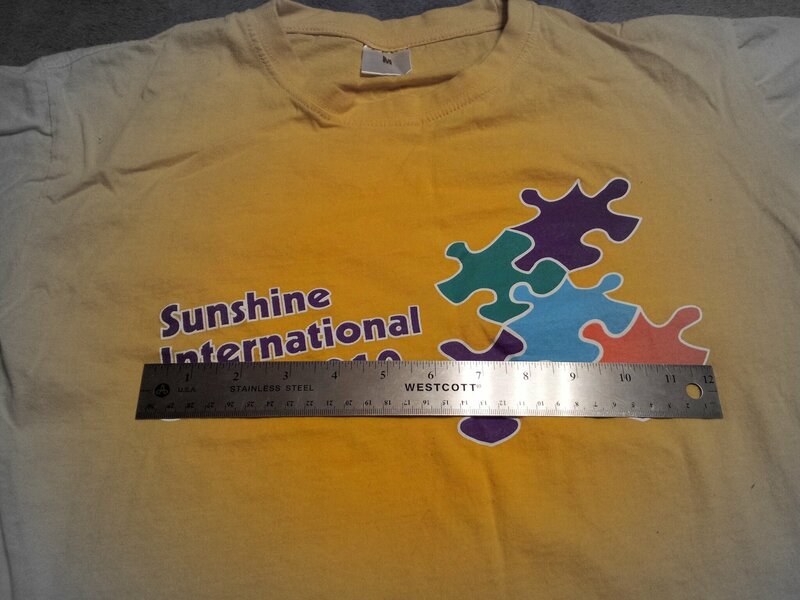 Each one of the blocks has something to indicate which shirt it is and the measurements. the shaded areas are where filler is required. Step 4: Cowboy up and start cutting. This took some doing. It took a lot of time and measuring. It took a lot of courage to make that first cut and embark on this journey. This is as far as I am for the moment. I still need to cut out all the filler pieces, but that I am not sure if I want to use t-shirt scraps or buy some material that can be pretty much the same throughout. Other than that my next step is to purchase fusible interfacing to iron on to the backs of the t-shirt to give them some stiffness and durability. After the interfacing is on I will begin piecing the shirts together. Then it is time to make a batting sandwich and sew on some fabric for a border and back. 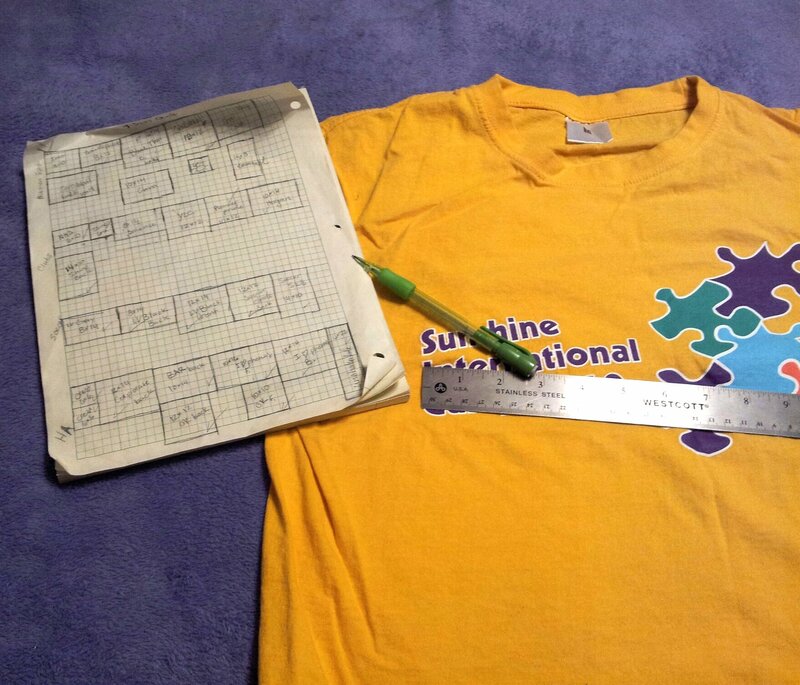 Have you ever made a quilt or t-shirt quilt? Should I use t-shirt scraps or a different material to make everything come together? This entry was posted in Crafts & Decor, JuneBug Challenge and tagged DIY, memories, quilting, t-shirt quilt. Bookmark the permalink.